Several weeks ago people began to come into the bookshop and ask for Stoner. We got so many requests we kept it by the counter within easy reach. Initially I figured the title referred to some marijuana puffing dude, a paean to slackerdom, but I was entirely wrong. 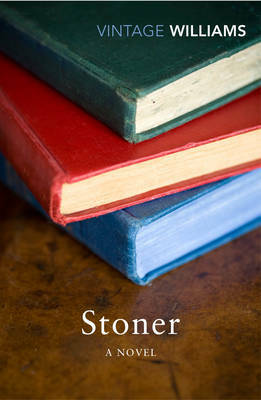 Stoner is a novel originally published in 1965, recently reissued by Vintage Classics. William Stoner is the name of the main character, a character not too dissimilar to the author, John Williams, apparently. It went into our “buy one get one half price” offer, and yet more people have bought it. I think part of the interest is that few people have heard of Williams, the novel is touted as a “forgotten classic”, and we all like the idea that we’re rediscovering something amazing. From the first page we know that Stoner is the story of one man’s unremarkable life. …he did not rise above the rank of assistant professor, and few students remembered him with any sharpness after they had taken his courses. William Stoner is the son of poor farm folk. From an early age (six) he becomes used to hard work and is expected to take over the running of the farm one day. He has no plans to ever leave the farm, but his father surprises him by sending him to college to study agriculture and the “new ideas” for four years. At college Stoner discovers what will be a lifelong interest in literature. For me, the books most devastating moments are those between Stoner and his parents. The writing is so understated, the prose so calm and clear. It’s incredibly moving. Stoner remains at the university. The one constant in his life is literature; he studies, teaches, writes. He marries a woman who seems only to exist to make his life a misery. My one criticism of the novel is how it is never explained quite why Edith is so unpleasant, not only to him, but also to their daughter. Where the novel succeeds beautifully is in its depiction of sheer ordinariness. Although Stoner occasionally glimpses something more, be it in his work, or as a father, or in love, those glimpses, those moments of hope, quickly fade. Stoner is left with the disappointment of being human. The reader understands this only too well. …she would live her days out quietly, drinking a little more, year by year, numbing herself against the nothingness her life had become. I really did care about Stoner. For all its quietness there are plenty of life events to keep the pages turning. Well deserving of its “classic” status, this is a book I’m thrilled is selling so well. How marvelous, and what a shame John Williams couldn’t know how popular this novel would become. That’s very Stoner-ish. Thanks for giving this a plug. I’d never heard of it, but it opens so, so beautifully. Soon as I finish my current read, I’ll be reading Stoner. Cheers. I’d be interested to know what you make of it, Bob.